Known for its geothermal waters, Iceland boasts an abundance of hot springs, steam baths and spas of every imaginable kind. Some hot springs claim they will cure what ails you, while others offer promises of skin rejuvenation. And then there are those that just make you feel relaxed and refreshed after a long plane trip. Although taking the waters is historically a very Icelandic thing to do, today many of the hot springs have added modern access features. Although some of the smaller facilities may be a challenge for people with mobility issues, two of the country’s largest geothermal spas are a good choice for wheelchair-users and slow walkers. Located near Reykjavik International Airport, the Blue Lagoon (+354 420 8800, www.bluelagoon.com) is Iceland’s most popular tourist attraction. 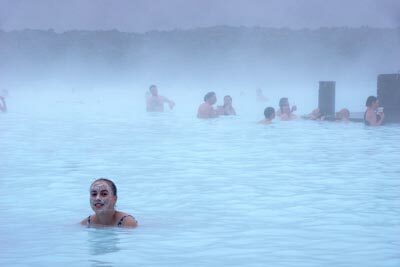 In fact, statistics show that almost everyone who visits Iceland, also visits the Blue Lagoon. Although it was named one of National Geographic’s “Five Wonders of the World”, it’s not exactly a natural wonder. The lagoon was formed in 1976 from discarded water from the nearby Svartsengi Geothermal Plant. Soon people began to bathe in the water, and many even raved about the curative properties it had. Today the totally modern facility includes changing rooms, saunas, a restaurant and of course a gift shop. Access is good throughout the facility, with level access to the main reception area, and barrier-free access to the changing rooms. The showers feature level access, and a shower chair is available upon request. There is also a family changing room with plenty of room for an attendant, and an accessible toilet with grab bars. There is level access to the indoor lagoon, which is equipped with a pool lift with a 440-pound capacity. From there it’s easy to swim or float to the outdoor lagoon. A water wheelchair is also available, which can be taken into the outdoor lagoon from the sloped beach area. The main activity at the lagoon is just relaxing and enjoying the 98 – 102 degree waters. Take some time to slather some silica mud on your face from the mud pots that line the lagoon’s perimeter. Not only is this a very refreshing treatment, but it also gives your complexion a healthy glow. Top it off with an algae mask, which you can purchase at the swim-up bar, and your skin will look and feel even younger. Admission is $45, but you can stay the whole day. Any incidentals, like lunch or drinks at the bar, can be charged to an electronic wristband that is issued to all guests. These wristbands also serve as locker keys. At the end of the day, you return the wristband and settle up your bill. In the end, the Blue Lagoon is the most accessible hot springs in the country, and a must-do for all visitors. Although a lot smaller than the Blue Lagoon, Laugarvatn Fontana Geothermal Baths (+354 486 1400, www.fontana.is) is another popular hot springs. Located about 47 miles east of the capital city, Laugarvatn Fontana features a variety of pools varying in size, depth and temperature. And although the pools are man-made, bathers can enjoy the natural beauty of the geothermal Lake Laugarvatn, which borders the spa. Stone artwork by Icelandic artist Erla Thórarinsdóttir graces the pools, and traditional steam rooms and saunas are located close to the locker rooms. There’s ramp access to the main building, with accessible parking in front. Inside, there’s plenty of room to maneuver a wheelchair, with level access to the adjacent locker rooms. There is also an accessible family restroom just off the front lobby. The locker rooms offer barrier-free access to the shower areas, which include a shower with a hand-held showerhead. There is level access outside, with a ramp down to the pool area. There are handrails on the pools, but you have to be able to walk a few steps to get into the pools. The staff is happy to provide assistance if needed, but they will not lift guests into the pools. Because of the layout of the facilities, this spa is a good choice for slow walkers. Admission is $25, and you can stay for as long as you want. Best bet is to arrive early, enjoy a light lunch or snack, and hit the pools before the afternoon tours arrive. 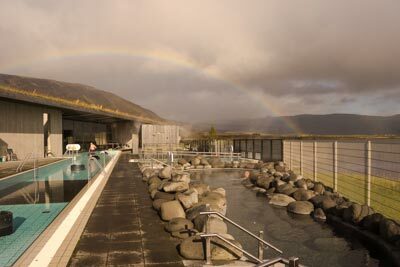 It’s the perfect place to enjoy a traditional Icelandic soak, steam and sauna. 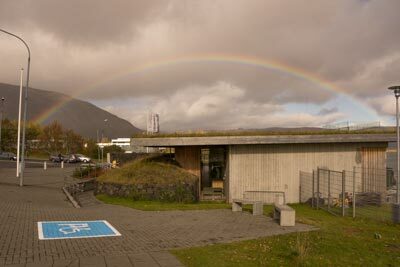 Several tour operators offer accessible day trips from Reykajavik to the Blue Lagoon and Laugarvatn Fontana Geothermal Baths. Prime Tours (www.primetours.is) offers day trips to the Blue Lagoon in a ramped van with tie-downs. The van can carry one wheelchair-user and four able-bodied passengers. It should be noted that the ramp is made of two rails, so it cannot accommodate scooters. The tour lasts for four hours and includes transfers to and from the Blue Lagoon. 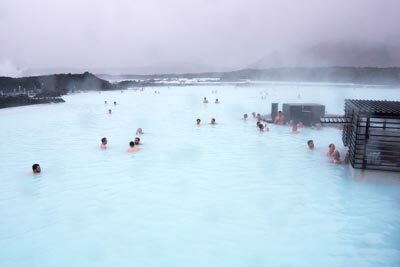 Passengers can also buy admission tickets to the Blue Lagoon from the tour operator, which allows them to bypass the long general admission line. For a more personalized tour to the Blue Lagoon or Laugarvatn Fontana Geothermal Baths, Hreyfill Taxi (+354 588 5522, www.hreyfill.is) can provide accessible transfers to either spa. Passengers can spend as much time as they want at the spas with this customized option. Finally, Reykjavik Excursions (+354 580 5400, www.re.is) also offers tours to the Blue Lagoon and Laugarvatn Fontana Geothermal Baths. Passengers must be able to walk and have their assistive devices stowed under the bus to participate in the tours. These tours cannot accommodate full time wheelchair-users. A stop at Laugarvatn Fontana is included in the Golden Circle tours, or if you’d like to relax before that international flight, the Blue Lagoon tour can also be purchased with an optional airport transfer.